Kim Stanley Robinson's new novel, Galileo's Dream, takes the titanic astronomer-mathematician from Renaissance Italy to the moons of Jupiter in the 31st century to assist in a political battle pitting science against religion. We talked to him about creating worlds. Some spoilers for Galileo's Dream below. 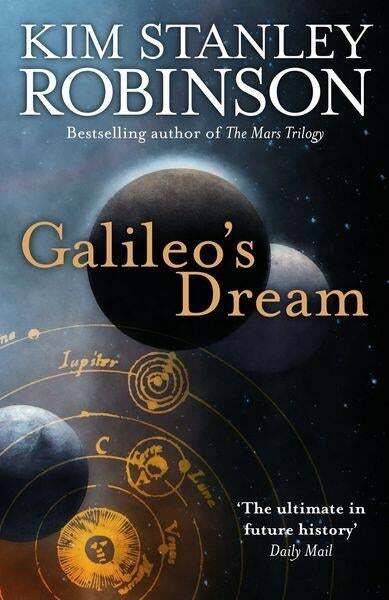 Robinson, 57, is a master at balancing both an interest in science and a commitment to character and theme: His Hugo-and Nebula- award-winning Mars trilogy (Red Mars, Green Mars and Blue Mars) is often called the finest example of world creation since Dune. He's also got an abiding interest in the environment — past, present and future. Galileo's Dream comes out with impeccable timing: Galileo discovered the Jupiter's four moons 400 years ago this month. The scientist, of course, was persecuted by the Church during the last years of his life because of his support of Copernicus then-controversial claim that the earth rotates around the sun. The Guardian said, "Elegant, charming, funny and profound, Galileo's Dream is magnifico." What made you want to write about Galileo? When I did the research for my novel The Years of Rice and Salt, I looked into the history of our scientific revolution, and Galileo was a major figure in that. He stuck out for his status as some kind of "first scientist," and for his tangled relations with his patrons and the Catholic Church, and for his flamboyant character. As a science- fiction writer the idea of writing about the first scientist seemed natural. When the image came to me of him visiting the moons of Jupiter in a future time, I had my way into the story. To what extent was this an exercise in world creation for you? I don't know, I think of every novel as "world creation" of one kind or another, so in a way you could say that this one was an exercise in world creation in just the way all novels are. I did have two pleasures of that sort this time, first in trying to suggest the feel of the years 1609 to 1642 in Italy, and then also to create a brief partial vision of a far future human civilization inhabiting the moons of Jupiter and presumably the rest of the solar system - but all through the eyes of Galileo only, so that it had to be presented at least potentially as his dream. So that part is not "hard sf" but some kind of Renaissance fantasia, or the future as Galileo would comprehend it. Is it fair to say this is your first novel set in the far future, maybe even your first unambiguously SF book, in some time? Yes, well, it's true whichever way you parse it, but I do regard alternative history as being unambiguously science fiction, for both historical and genre definition reasons, and so I include The Years of Rice and Salt as unambiguous sf, and it came out in 2002. But it was not far future; indeed, it started pretty far in the past. For far future sf I would have to go back to Blue Mars, which I finished in 1995, or even The Memory of Whiteness, which I finished in 1984. So yes, in regard to far future science fiction (if you call five hundred years far - some sf writers don't) then it's been a really long time since I've done anything like this. Really, because of the time travel and the aliens (shh) involved, it's true to say that I've never done anything like this book before. You and your work are associated with environmental causes; in some way the movement has gone mainstream. Do things seem to be getting better or worse than they were a few years ago? I think without a doubt they are getting better, in that climate change is a looming long-term crisis that has galvanized the scientific community so much that they have managed to lead the environmental movement, the public, and the politicians, into considering this to be a major problem to be faced and solved as soon as possible. This was not the case even five years ago, so that is progress (though our actual carbon burn has not yet started going down). When you consider how much the scientific community tried to stay away from policy before this issue came up, it is really a remarkable thing - something new in history - the scientific community, taking a political stance on something! It is a hidden little revolutionary moment; because the implication here is that the ordinary workings of capitalism no longer get to call the shots, that the scientific community is saying, "We must do something that is not immediately profitable, or else disaster will ensue" - and we, the public, have to choose who to believe and how to act. It means we are entering a kind of civilization crisis period, likely to last for the next generation at least. In some ways that's bad, in other ways it clarifies our choices as individuals and societies. Social justice, for instance, becomes a survival mechanism rather than just a good idea or the right thing to do. Meaningful jobs in landscape restoration, power swap-out, and the green economy generally will be widespread; in short, we will have a meaningful goal as a civilization, which is the creation of a permaculture. How important should science be to science fiction, and how central is it to your work in particular? It completely depends on what kind of science fiction you are talking about, and I mean book by book, story by story. Some science fiction is fiction about science, and there the science is important and really the subject of the story. In other SF ideas, the details of the science that created the future are not what is important to the story, and so it can be implied in the backdrop and never referred to specifically, just as in a contemporary novel you wouldn't go into the details of how the TVs work or the principle of airplane flight, etc. So, I have done science fiction of both kinds, or I should say many kinds, and tried to focus the methods of the book on the goals of the story. That being said, I am very interested in science, I am married to a scientist, I have hung out with scientists a lot, and done a little bit with the National Science Foundation; and several of my novels, especially the Mars novels and the climate novels, have been fairly focused on scientists as major characters. And science as an activity and a changing of the world. Without saying it is central to my work, it is certainly very important. Mostly, the way to put it is that I think of myself as a science fiction writer, and believe that our culture is a kind of science fiction that we are all collaborating on together, so, to the extent science is a cultural dominant in our world, and just in trying to be a good novelist, I stay interested in science, as part of trying to understand what's going on. Galileo was harassed by the Catholic Church during his lifetime — even living under house arrest for his last years. Fourteen centuries in the future, he ends up in a place where science and religion are still at war. Some things never change, eh? I think there have been a lot of changes in this dynamic, but there are still some real conflicts in some people and in some parts of society concerning these two kinds of world-view or ideology. Some of the conflicts are real, I think, while others are the results of misunderstanding on one side or the other, or both. Galileo himself always insisted he was doing his work as a good Catholic and he was insisting on the Copernican view of the solar system as a way of keeping the Church from making a doctrinal error that it was going to regret later. He never gave up this position, and I think his vision of a reconciliation between science and religion, and science as a kind of devotional or worship of God's handiwork, is one that could still work for people who "believe in science" while also feeling that there is something miraculous and sacred about life and the universe. So, that particular "war" is a kind of category error and the result of inappropriate arrogance on either side, and an urge to fight, or proclaim one's righteousness, that does no credit to anybody.